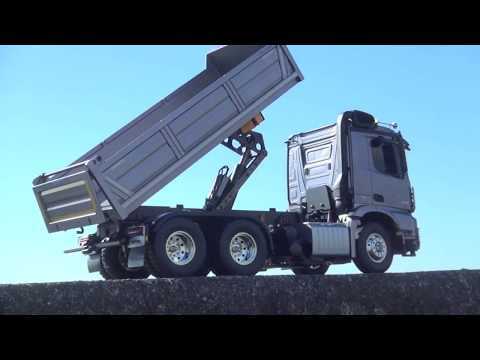 The Tamiya R/C Mercedes Arocs 3348 Dump Truck Model Kit is a highly accurate 1/14 scale radio control model that recreates the Mercedes-Benz dump truck. The model's ladder frame chassis features aluminum side channels with resin cross members and is equipped with a highly realistic suspension utilizing metal leaf springs and friction dampers. A front-mounted motor and 3-speed transmission power the two rear wheel axles, which are fitted with built-in differentials to enable smooth cornering. A (minimum) 4-channel R/C system and multi-function unit allow you to drive the vehicle and experience realistic lights, sounds and vibrations. Interior details include: seat and dashboard. 3-axle chassis utilizes a tough ladder frame with aluminum side channels and resin cross members. A realistic drivetrain setup sees the front mounted motor powering twin rear axles. 3-speed transmission can be controlled via a 4ch R/C transmitter.